Ajrak, Rogan Art, Bandhani, Weaving. 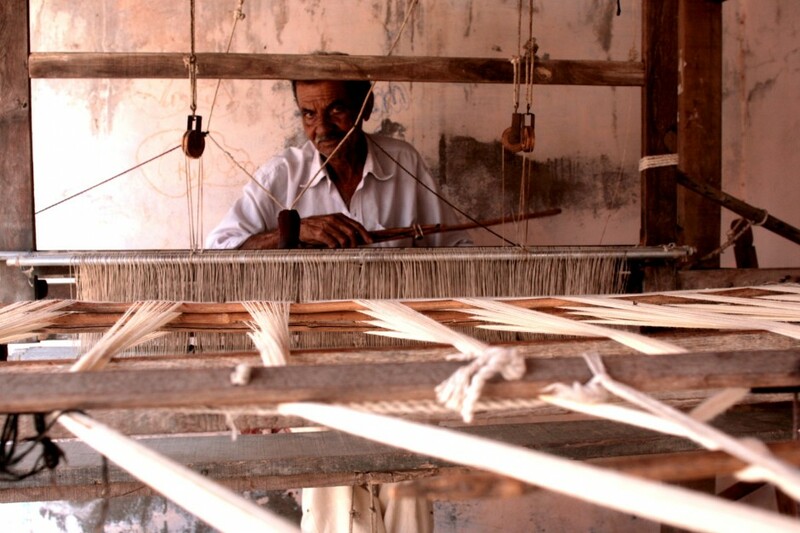 Shaina Shealy photographs the crafts of Kutch, India. WHEN I WAS YOUNG, my mom was my personal shopper. She’d come home with ten outfits and force them over my head as I stood passively with arms up. She usually ended up returning all of her purchases, only to try again, until I’d settle on something not too itchy. I hated shopping. Malls still overwhelm me. I can’t figure out how to select the right blouse out the hundreds of stacked, starched variations, each with crunchy paper tags dangling at their sides. The gaudy colors and crisp fabrics that hang perfectly under the fluorescent overheads are supposed to go on my body? The idea of it feels distant. But here in India, shopping is a loaded exploration. My walks through the market are guided by the pull of human connection, the urge to understand the laborious processes behind the colors, and the stories of lives that have synchronized around craft. I’ve been living in Kutch, India for 10 months working at a grassroots development NGO and sneaking off to artisan villages in my free time. Kutch is a bland desert with sparse vegetation. Colorful villages spot its vast expanse, where a wide diversity of languages, customs and cultures coexist. Neon embroideries with sparkly mirrors and deep-hued dye pop against its backdrop. Many communities of Kutch have inherited the traditions of craft as a primary livelihood, and their families have nurtured expansion and innovation of their respective crafts for generations. Traditionally, craft production in Kutch was part of a socio-economic web that sustained interdependent barter relationships among local families. A family of weavers might trade hand-woven turbans and shawls to a family of farmers in exchange for lentils. The farmer’s wives might embroider ornamentation onto the pieces before trading them back to the weavers for more goods. High-skilled handwork had further value as artisans reserved their masterpieces for dowry collections, and labored over unique ornamentations for that would be presented at wedding celebrations. Bandhani tiers may tie knots for months onto fabric for a wedding piece that would remain in the family for generations. Each family in Kutch boasted its traditional profession, and the families worked in synchronicity to provide for one another’s needs. As appreciation for handwork expands among national and international markets, artisans in Kutch are shifting their production to meet market demand beyond that of their neighbors. Kutch artisans are producing craft for nation-wide retail chains and international exhibitions. They are collaborating with high-fashion designers and studying design trends to broaden and innovate their traditional approaches. They are partnering with NGOs to test ecological modes of production in an effort to reduce their greenhouse gas contributions. When I browse markets in Kutch, I touch everything. I feel the products for rough edges, loose loops of thread, clumped prints, spots where the dyes didn’t soak in evenly. Imperfections remind me that the products are more than products; they are ballads of sustainable development, pride, fine art, funny stories, labor, livelihoods, beauty, precision and tradition. 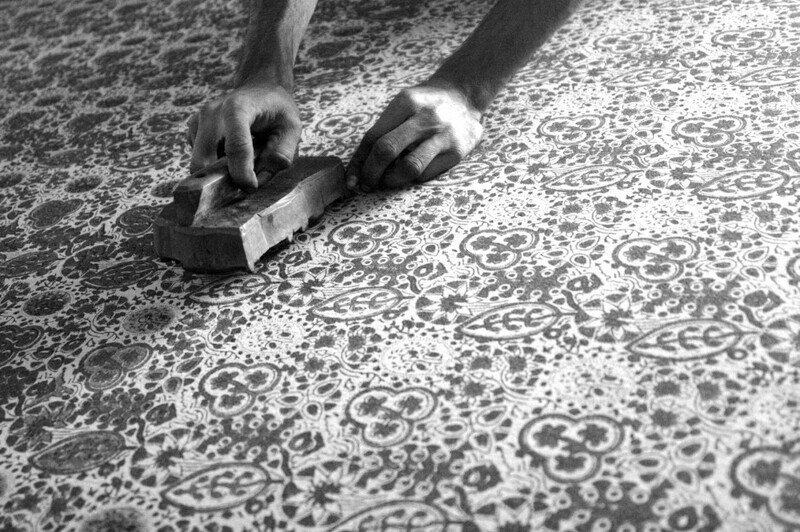 I’ve spent time in block-printing villages and can distinguish block-printers from dyers by the dyer’s Indigo-stained nail beds. I’ve listened to weavers boast about the timelessness of their craft, and admit to their diminishing local market due to industrialization of textile mills. I’ve seen women embroider free-handedly with precision that most cannot master even with a pattern-outline to follow. 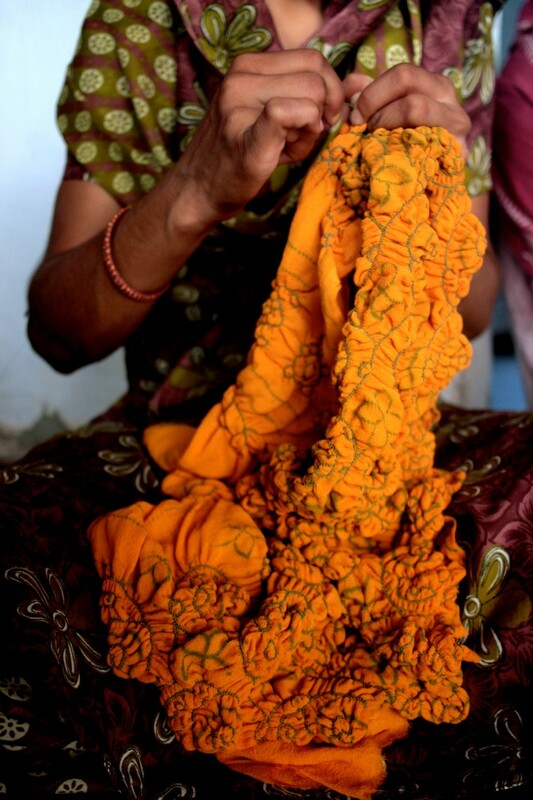 Artisans color Kutch’s environment and build its economy, partnering traditional livelihoods with innovation. "Breathe in," Dr. Ismael shoved a densely decorated yellow scarf into my face. It smelled like my lunch. "Turmeric and Pomegranate skins for yellow," Dr. Ismael explained that smell is the way that buyers ensure that the dye used is natural. Dr. Ismael was born into a centuries-old tradition of Ajrak, or block printing, and is a prominent Ajrak artisan in Kutch. His family migrated to Kutch from Sindh in the 16th century, when the King of Kutch recognized the craft and invited them to settle in the region. Dr. Ismael prides himself on his use of natural dyes, and his ability to combine the designs of traditional wooden blocks with modern ones. 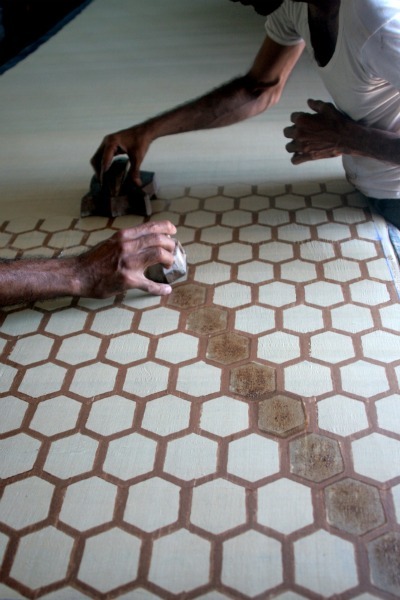 Block printing is a laborious effort of precision. First, cloth is stretched and pinned onto a table. The printers smother wooden blocks with resist and hover them over the cloth to ensure a symmetrical application. Once they are aligned, the block is pounded on the cloth with a heavy-forced whack. This same motion is performed hundreds of times until the cloth is completely covered with the block’s outline in three different resist bases. The cloth is then dyed in a base color and laid under the sun to dry, rinsed and dyed again until the cloth is transformed into a crowded mural of colors and motifs. Dr. Ismael’s textiles are used as saris, blouses, scarves and long shawls. Dr. Ismael received an honorary PhD in the arts from De Monfort University. He hangs his degree next to his National Merit Certificate, which he received in 1992, and the UNESCO seal of excellence for his block printing. Dr. Ismael’s family name, Khatri, literally translates into one who fills color. The Muslim Khatri community is historically a family of dyers. In Kutch, Khatri communities work with a multitude of crafts that involve dye including Ajrak and Bandhani (Kutchi Tie-Dye). Traditionally, only men do the actual dying of the fabric. Dr. Ismael works closely with fashion designers from all over the world. The designers can design their own blocks, but often stick with Dr. Ismael’s traditional collection. 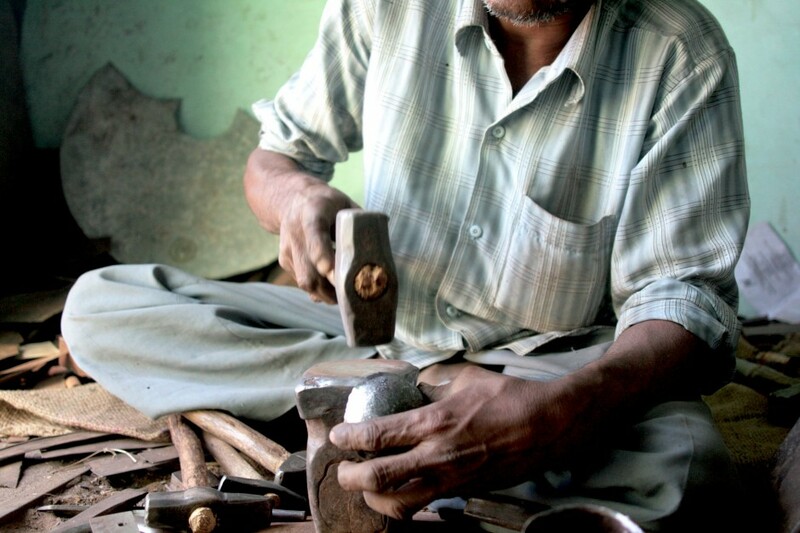 Dr. Ismael sources his blocks from a family in a neighboring village who specialize in woodcarving. Blocks are retired when the edges turn rough or uneven. Dr. Ismael has blocks that are over 200 years old. 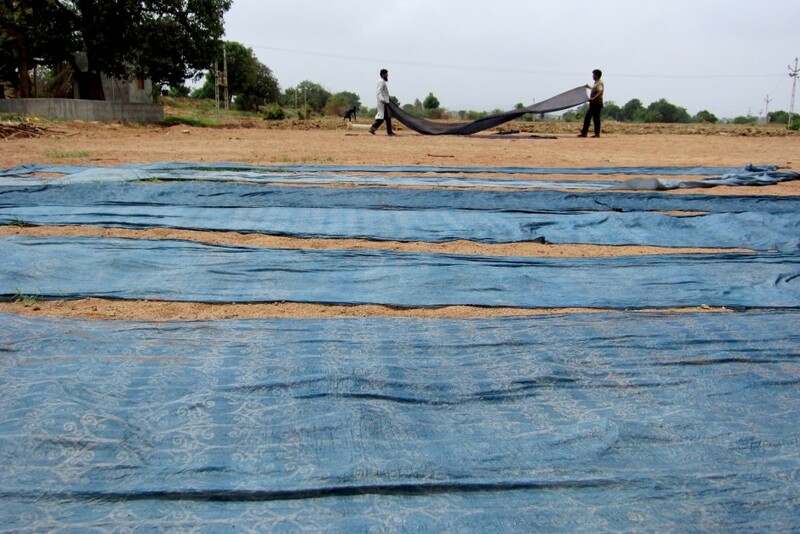 When families of block printers moved to Kutch, they settled in a village called Demadkah for its close proximity to a river in which they washed their fabric. But after 400 years of use, in 1989, the river dried, and water levels from wells and tanks continued to fall. 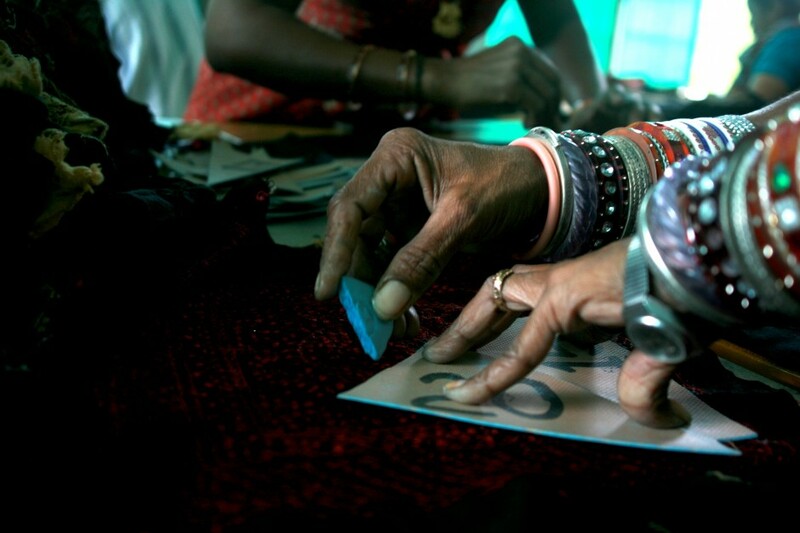 After a massive earthquake in Kutch in 2001, the block printers were forced to relocate. They settled in Ajrakpur, a village built in coordination with relief NGOs. 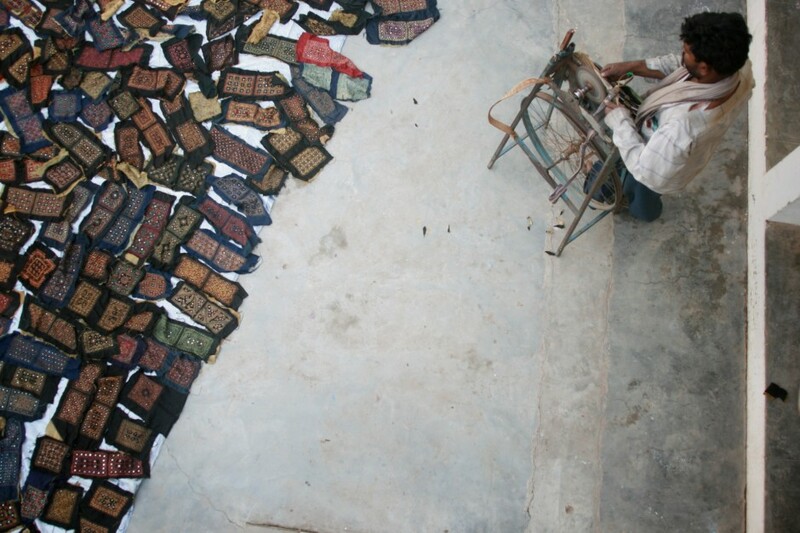 There are over one hundred families living in Ajrakpur, and 30 official block printing workshops; almost all of the families in Ajrakpur generate their primary income from Ajrak. Dr. Ismael remembers days in which he spent rubbing pomegranate skin water onto fabric as a child. 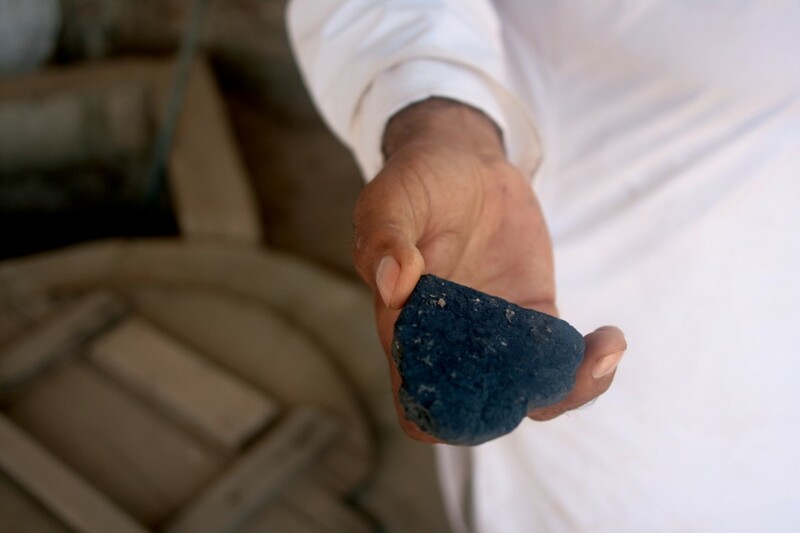 His family was one of the pioneer families in Kutch to experiment with natural dyes. When he showed me around his house, he first led me to a tree in his backyard. Its bark is used for orange dyes. He then led me to a big bucket of “rusty things” full of bicycle pieces and old scraps of fences. It had been fermenting with sugar cane, chickpea flour and iron for months, and smelled worse than a basement of a frat house. The bucket’s fermentation is used for black dye. Dr. Ismael uses three types of resist made out of tamarind seed, Arabic gum, clay and millet flour. Dr. Ismael and his family have recently been working with an NGO to discuss a recyclable water system that can be used to rinse their fabrics. In a small house in the interior of Nirona village, three men sat in their homes next to plates lined with small bowls of bright, gooey colors. They squinted over pieces of cotton cloth, drawing precise geometric shapes. 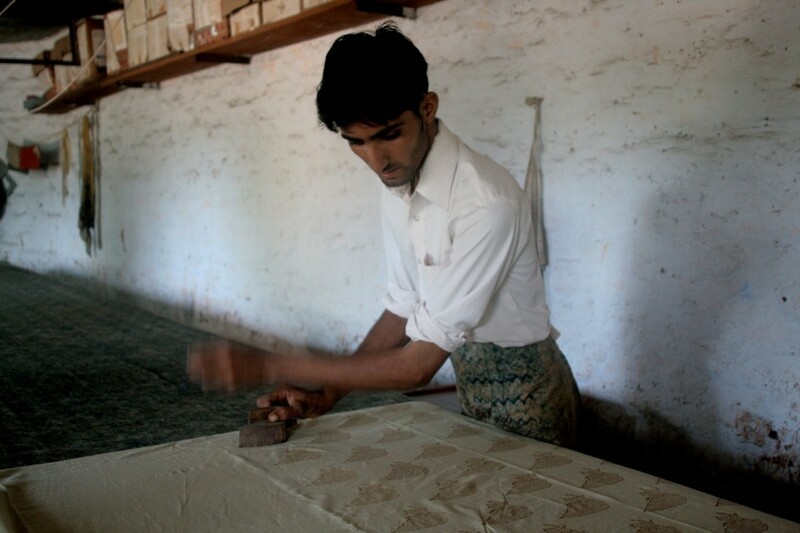 Rogan art was one of the first methods of textile printing, and now employs only a handful of artisans in Kutch who handprint cloth for wall-hangings and saris. 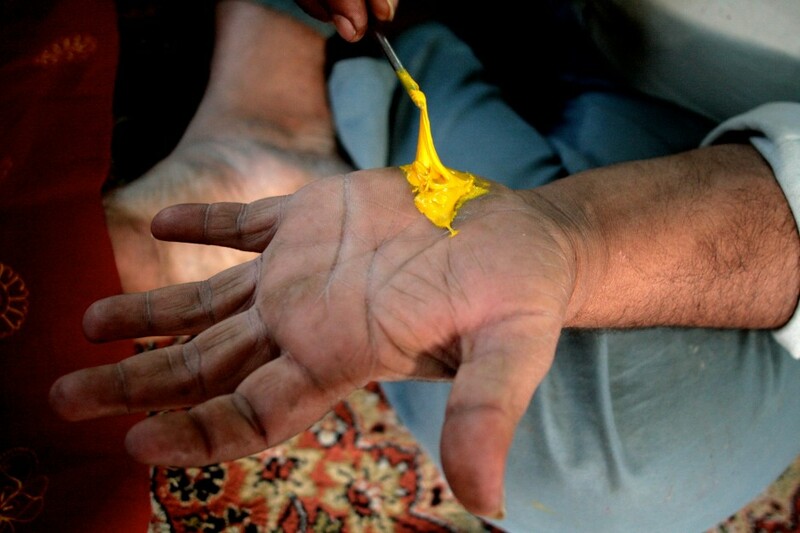 In the first step of creating Rogan art, artists mix pigment with castor oil to get a sticky paint. 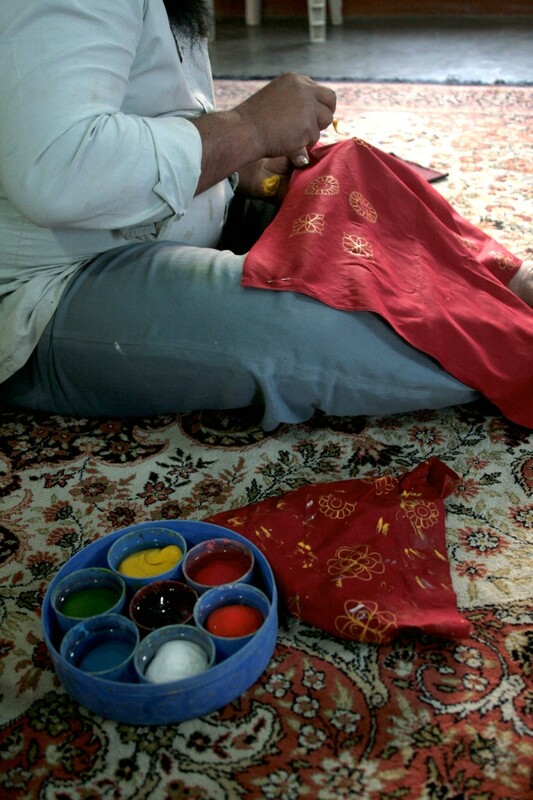 They apply the paint to cloth with a tiny iron stick called a kalam. The Castor plant is grown in large yields throughout Kutch due to its high tolerance for drought. 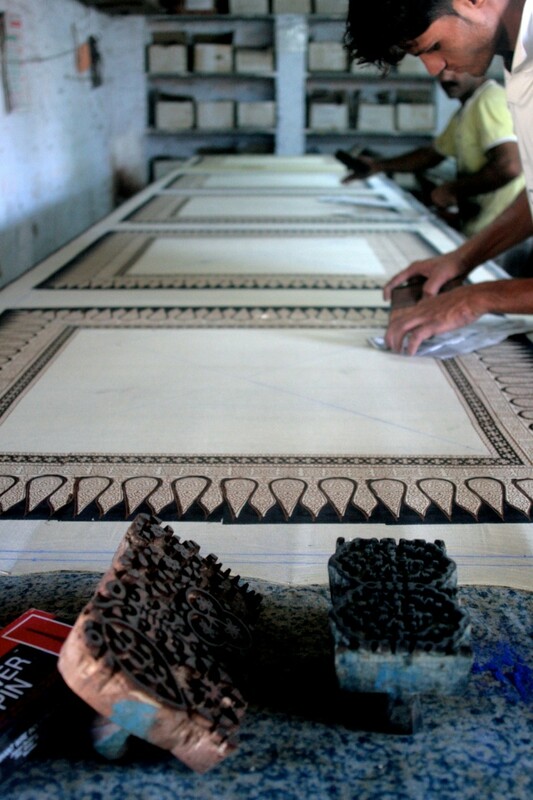 Artists use the kalam to draw an outline of a shape, and then press the outline against fabric to create a mirror image. The original outline is replicated in a geometric pattern of simple shapes and intricate motifs. Since Rogan artists are Muslim, they refrain from depicting human or animal forms in their art. Most of their motifs are floral. Nirona village also hosts copper bell makers. When I first entered Nirona, I smelled a strong burning. A petite man appearing in his 50s met me on a street corner and led me into his home. He brought me chai and I sat on the floor of his home and studio. He laid out his collection of hundreds of copper bells of all sizes and shapes on the ground in front of me. He chimed the bells in my ears and I listened to each distinct sound. He then took his tools and began to pound together a copper bell in front of me. First, a metal base is pounded into shape with a hammer, and designs are etched into the metal with a sharp nail. The base is then sprinkled with powdered copper. Women kneed mud and cotton and flatten small pancakes out of the mixture. The cakes are draped over the metal and copper powder base of the bell, which is placed into a kiln. The cotton and mud mixture burns away to melt the copper into a textured film that glows orange, red, yellow and blue. A wooden strip is situated inside the bell and the shape is adjusted until the sound is perfect. 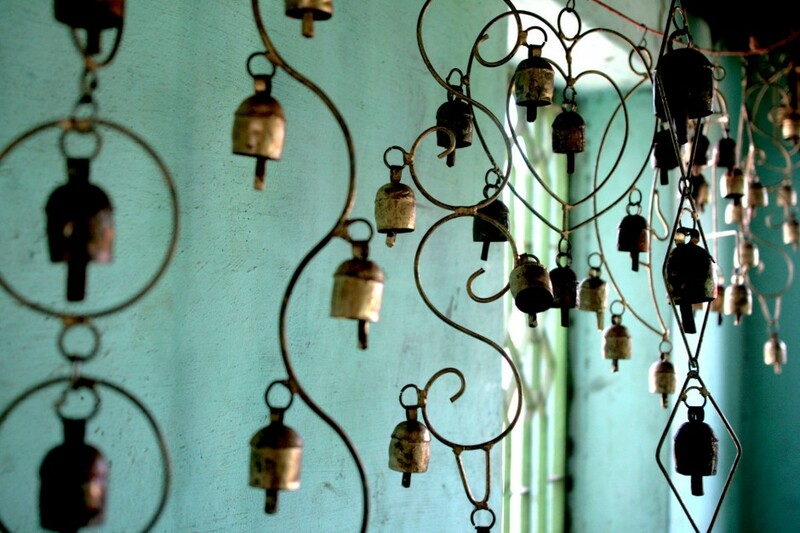 The bells come in 14 distinct sounds. The sounds that each bell produces depend on its shape, size of body, curvature of bottom rim and thickness of the wooden strip that hangs from the bell. Copper bell production includes the entire family of a bell-maker. As the man who headed the demonstration pounds on the metal, his wife kneads mud with cotton. His children hold the bell in place in the kiln with a rod. They listen to final sound of the bell and have the final say in approving their father’s tuning. As our demonstration came to an end, clanging metal echoed in the distance. I walked out of the bell-maker’s house to find dozens of homes operating in a similar routine. I thought I had just visited the bell-making family of Kutch, but homes throughout the village had equally massive productions. Baskets full of fresh copper bells stood by the ovens of several homes throughout the village as women kneaded mud and cotton. I am currently learning Bandhani and have been working on the same scarf for almost six months, slowly figuring out how to hold a thin thread between my thumb and index finger, and guide it with my pinky to tie knots around tiny bunches of fabric. The first time I tried tying, the tips of my fingers were numb after one hour, and I had only completed four dots. 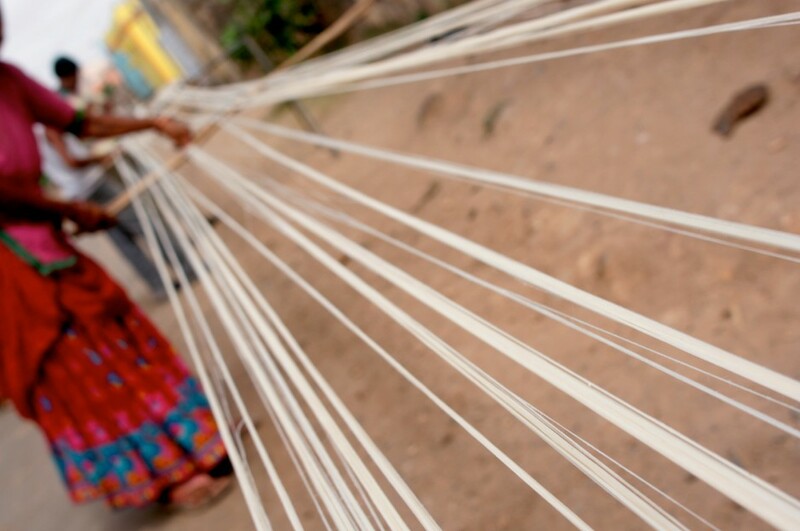 In the first step of Bandhani production, women tie small knots onto fabric with thin thread. After the knots are tied, the fabric is dipped in dye – the knotted threads protect the fabric underneath from retaining dye. When the dye has dried, the knots are ripped out, exposing small rings of undyed fabric. 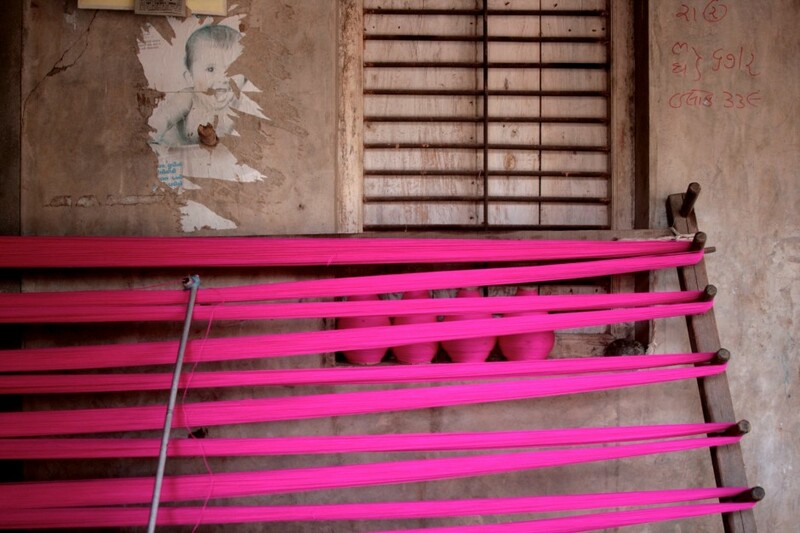 The above photo shows a scarf tied into knots before it is dyed. Bandhani dyers use a variety of dying techniques. My bandhani instructor, Jabbar, is a pioneer of natural dyes and travels the world to lead workshops about natural dyes. The practice of Bandhani is deeply rooted in Kutchi society and was traditionally made for small trade and dowry use. Tying is accessible to women because they can do it in their homes. My Bandhani instructor, Jabbar, comes from a family tradition of Bandhani. But, while the women in his family have always tied, the past four generations of men ceased dying to pursue other interests such as commerce and banking. After Jabbar graduated with a degree in commerce about ten years ago, he decided to revive the traditional craft of his ancestors. He had grown up watching his mothers and sisters tie, so he first went to them to learn the first step of the process: tying. Jabbar works with some of India’s top designers and his high-fashion Bandhani pieces have been displayed during many of Mumbai’s fashion weeks. Bandhani is a traditional Kutchi craft, but Jabbar’s innovated patterns and designs have placed him in a market that demand high fashion. Laquer, the tradition of decorating woodcarvings with Lac, made its way to Kutch through Sindh generations ago, and is hosted by the Wadha community. Currently, there are around 20-30 Laquer artisans in Kutch who color hand-carved wooden items. Laquer is created from a mixture of Lac and vegetable dyes, which are molded into shiny sticks of color. The color is applied as a film of marbled colors onto hand-carved wooden items such as serving spoons and spinning tops. The Wadha community is a semi-nomadic community whose members originally lived in jungles. Historically, they sourced wood for their craft from the jungles in which they lived. They also sourced Lac, a natural secretion from insects, from the jungle. Members of the Wadha community currently mix other dyes with Lac to get their rainbow palette. The Lac is applied to the wooden items with a rotating hand lathe, which spins back and forth to create a marbled affect of color. Mostly, men apply the Lac onto the wooden items, while women prepare the Lac to create colors. Embroidery is the only craft in Kutch that’s whole process is specific to women. Throughout the villages of Kutch, some women have limited mobility due to patriarchal societies, religion and other social factors. Embroidery is an outlet for expression and creativity and a mode of gaining economic independence, and women are able to embroider within the confines of their homes. 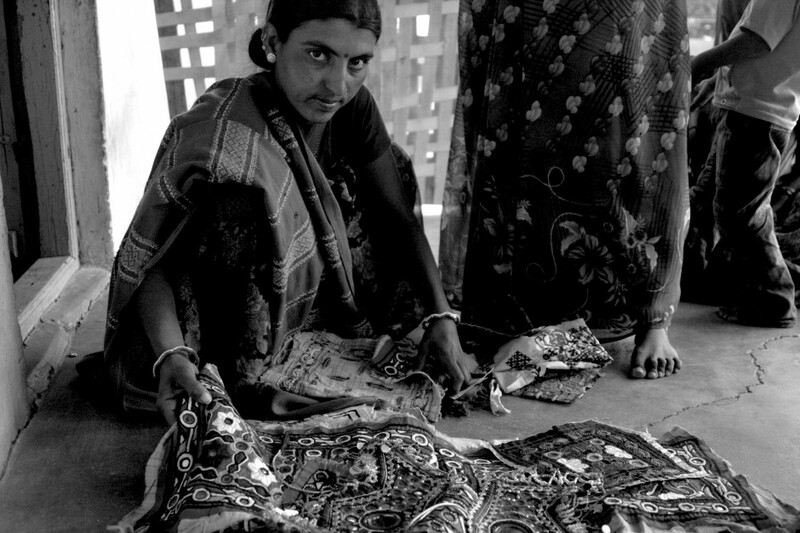 Middlemen in Kutch exploit the women’s craft by buying it for very low prices and then selling it to retailers and buyers at a higher mark-up. However, there are initiatives that aim to empower women to protect themselves from exploitation by providing them with negotiating skills and connecting them directly to markets. 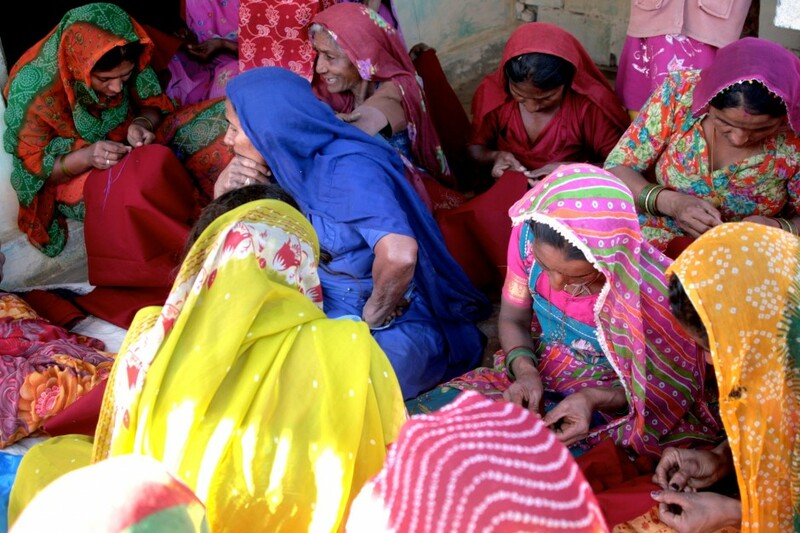 Several NGOs and collectives have sprouted in Kutch to facilitate marketing and design tools for embroidery artisans, and to advocate their empowerment. 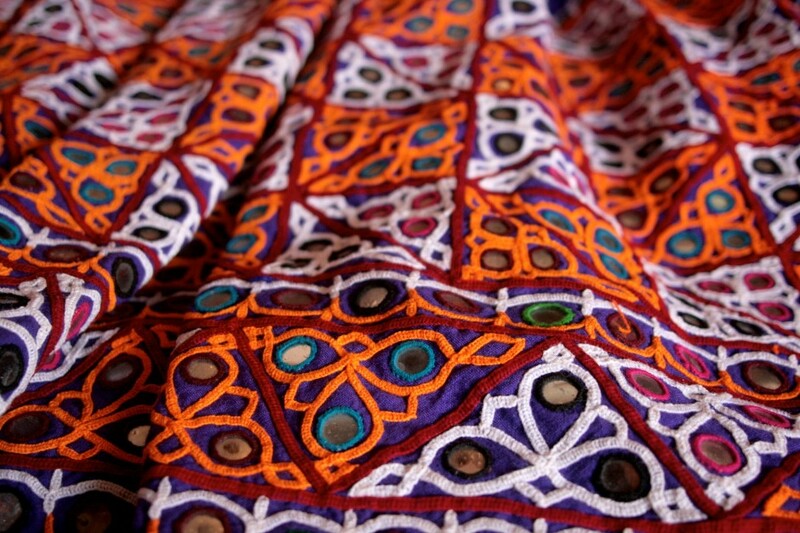 Each community of Kutch has its own embroidery heritage, style and motifs. Rabari embroidery, for example, is full of sharp angles and abstract, geometric designs, while Mutwa embroidery contains round designs and floral motifs. When worn as part of traditional dress, embroidery styles identify the marital, social, religious and age statuses of women. Kutchi embroidery is labor intensive. Much embroidery contains hundreds of cracked pieces of glass, which are sewn into the cloth as shaped mirrors. The final pieces dazzle in the light. 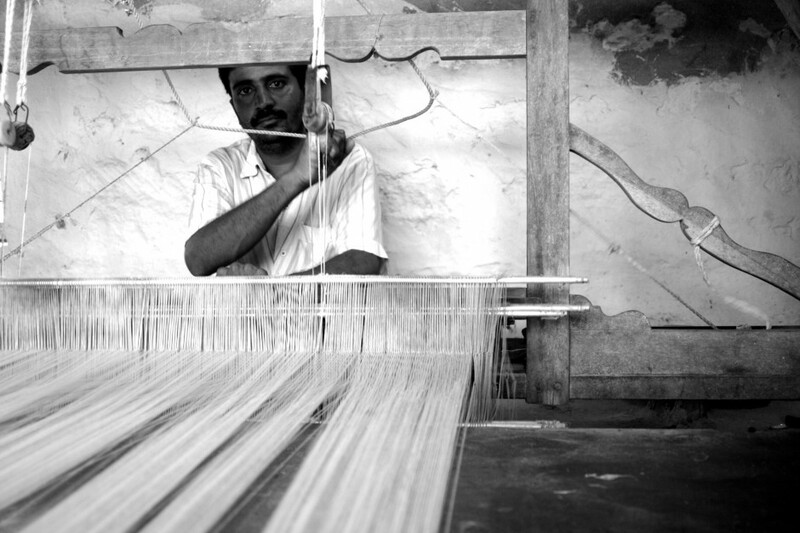 Handloom weaving in India dates back to the Mohen-jo-haro era of 3000BC. Weaving has a unique history in Kutch – popular myths of how members of the Meghwal community (a weaving community) arrived in Kutch from Rajasthan to provide weavings for local communities of farmers and cattle herders. Since the earthquake in 2001, the numbers of weavers has reduced from 2,000 to 900, and the art of the handloom faces a threat of distinction. 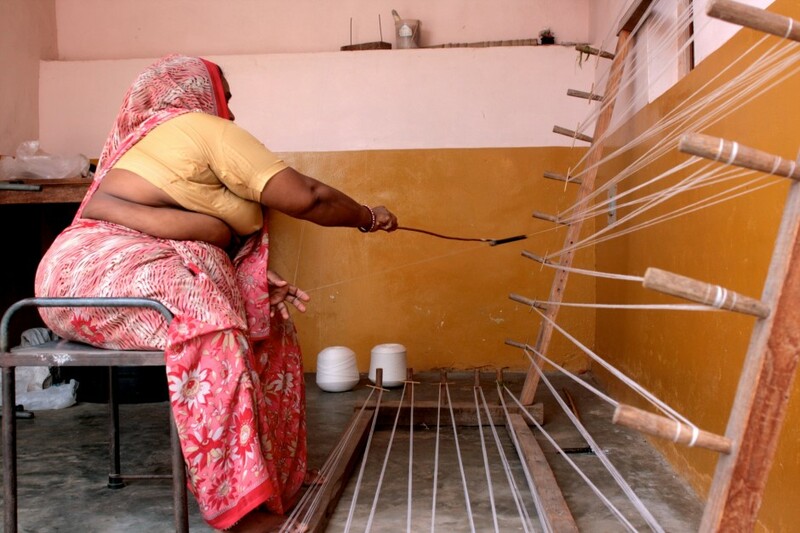 Above, a woman prepares the warp by applying threads to the vertical base of the loom. Weaving on the pit-loom is a Kutchi tradition. Traditional weavings in Kutch were originally made with sheep wool, sourced in partnership from the surrounding Rabari communities who herded sheep as the foundation of their livelihoods. The weaving communities then traded woolen shawls back to the Rabari community, whose women would embellish the pieces with embroidery or bandhani. Today, the span of materials has broadened to include cotton, silk, rayon, and a range of acrylics, which are often cheaper and more durable than local wool. Weavings in Kutch are typically created with plain weave and are then embellished with extra weft ornamentation. The processes of weaving include drafting (to keep the warp threads parallel to one another and to divide them into sheds), denting (drawing warp ends through the dents of a reed), shedding motion (opening the warp threads by the foot treadle), shedding for extra weft, picking (insertion of the weft through the shed), picking by hand for extra weft insertion and beating. Weaving with the hand throw shuttle is a characteristic of Kutchi weaving. 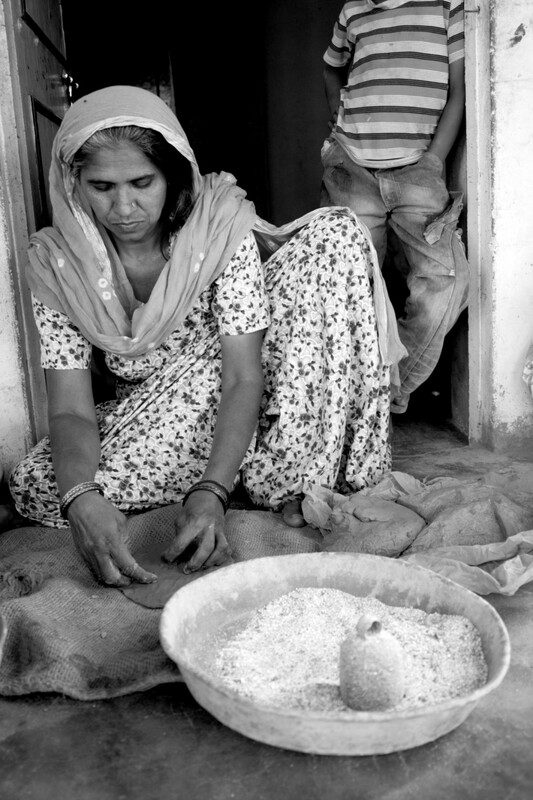 In the above photo, a woman continues warp preparation by brushing a mixture of onion and rice or wheat flour onto cotton threads as part of the sizing process. Sizing increases the strength of the threads and makes their shape even to decrease thread breakage and irregular shaping. 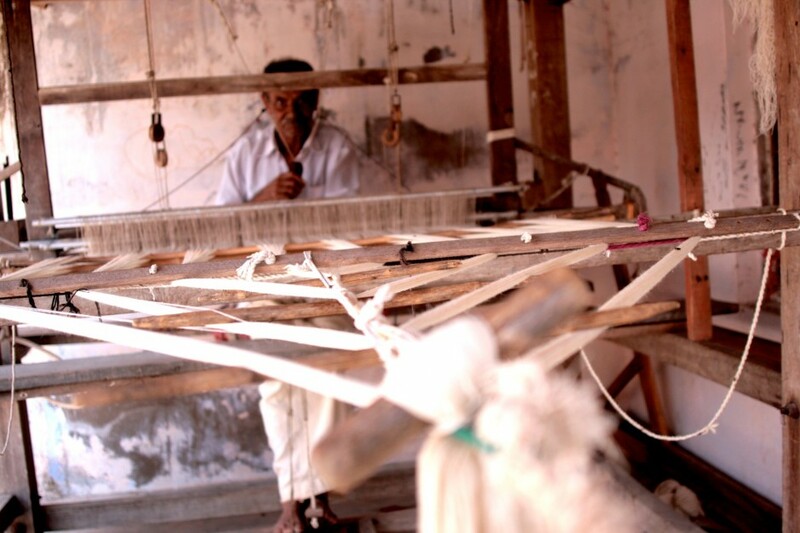 Since the introduction of textile mills, handloom weaving has lost much of its local market. Weavers in Kutch have had to expand their market base by connection with national and international designers and buyers. Some weavers have partnered with local organizations to source local, organic cotton in order to increase the ecological sustainability of their production.